– Nominee posts an image of the award on their blog. 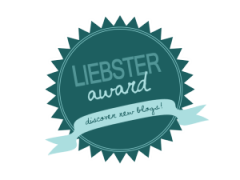 – Nominee links back to the nominator’s blog and of course thanks them. – Nominee answers 11 questions nominator ask of them. – Nominee then nominates 11 new bloggers they deem worthy with less than 300 followers & make sure to tell them. – Nominee poses 11 questions for their nominees to answer. After breaking up with my long term boyfriend, joining online dating provided both me and my family/friends with a bit of light entertainment. I went on numerous dates, had numerous interesting experiences and met plenty of people. I wanted to share the experience of modern dating & make people laugh at the same time. 3. Shoes or bare feet? Bare feet… Unless flip flops are involved. 4. Who is your favorite author and why? Sebastian Faulkes. His books are so engaging and realistic. Birdsong was one of the best novels I’ve ever read. If you haven’t been introduced, it’s definitely time. 5. What is your most prized possession? A poem written by a soldier to his lover which he hid under the floorboards of a house. I was given a copy on a visit to the said house but can’t remember where it was. It’s so inspiring. 7. What is the most delicious food you have ever eaten? Traditional Indian cuisine at a local restaurant. 8. What is your favorite quote and by whom? ‘Sometimes we need to stop analyzing the past, stop planning the future, stop figuring out precisely how we feel, stop deciding exactly what we want, and just see what happens’ – It couldn’t be truer. 9. If you could meet anyone dead or alive, who would it be? Audrey Hepburn. Potentially a complete cliche but her films, her work and her image are historic and fabulous. Hmm, well seeing as it hasn’t been going on for too long, I’d say it’s Online Dating: Business, Pleasure or just Off-Putting? I’d say to anyone who’s thinking of online dating… Do it. Why not? You’ve got nothing to lose. Everyone seems to think meeting someone online is something to be ashamed of but it’s not. If you manage to make friends, have a great time and potentially meet someone you quite like then it’s worth it! Now apparently I have to nominate some blogs and come up with some questions! 1. What’s the best part about writing your blog? 2. What inspired you to start writing it? 4. The best chat up line you’ve experienced? 5. The worst chat up line? 6. Best way to meet someone? 7. What’s your advice for those who’ve lost all hope when online dating? 8. Strangest place you’ve met someone? 9. ‘He’s Just Not That Into You’ – Agree or Disagree? 10. If you could go on a date with a celebrity, who would it be? Look forward to seeing your answers ladies and gents!